March 19th 2011 was the day my life would change forever. I remember every millisecond of that day . You always think when you lose someone you love dearly you would feel the second that person has passed or you would sense something was horribly wrong . That didn’t happen to me. I woke up that morning and never sensed anything ! Even took my son to go swimming at a local pool that afternoon. After I got home from the pool and finished changing my 1-year-old I could hear my cell phone vibrating like crazy. I opened it and it said I had 10 missed calls and a ton of text messages. Before I could check them my phone starting ringing again . I picked it up and could hear my little sisters voice on the other end. As soon as she said hello I knew something was terribly wrong . She asked where I was , then proceeded to tell me that Josh was found dead about 30 minutes ago . She said it appeared he had died in his sleep. Everything in my world came crashing down in that moment. I fell to the floor like a little child and just screamed at the top of my lungs. All I could do was scream and cry . I couldn’t move , I couldn’t respond to anyone , I just wanted to wake up from this horrible nightmare and every breath I took hurt . In the days following my family learned that Josh did not die of natural causes and that the cause of death would have to wait for a toxicology report. We started asking all Josh’s friends what happened that night . We asked the RCMP what they knew and they basically told us that it appeared to be an OD but there would be no investigation. They said that the people at the scene had no knowledge of any drugs so they had no reason to question the other people who attended the party. Soon after , people starting coming forward alleging Kyle Fredericks had sold Josh 12mg of a 30mg dilaudid pill at a party in Berwick the night of March 18th . We called the RCMP and told them everything we knew. We even gave them the pictures of the party my brother attended that night . They still refused to question any of the individuals involved. After becoming frustrated with the lack of investigation into my brother’s death I filed a complaint against the New Minas RCMP. 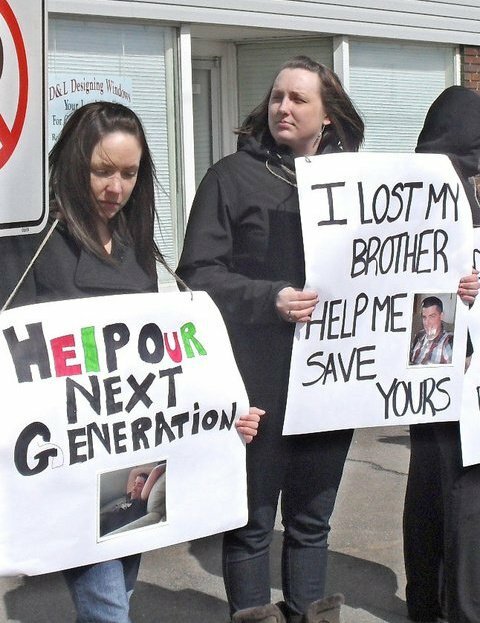 As soon as my brothers funeral was over I started a campaign called Get Prescription Drugs Off The Streets to make the public aware of the prescription drug problem in the Annapolis Valley . I wanted to make sure that Josh did not die in vain . I wanted him to be remembered for great things , not his one careless mistake. I wanted to prevent other families from going through the heart wrenching torture my family endured. – May 2011 The Gould Report Was Released . – October 2011 N.S. Government gives Annapolis Valley Health funding for methadone treatment. Josh had been employed as an Arborist in Edmonton, Alberta, and recently returned home to be with family. He enjoyed paintball, skateboarding, skydiving, bungee jumping and snowboarding, especially in the Rockies. He participated in the Kentville Minor Hockey program for 12 years. He loved children and volunteered at the Berwick Day Care. Next Post In Response To Bob Williams Opinion In The March 22nd Herald. Thinking about you and your family today Amy. I am sorry. Hugz Amy… you have done wonderful things girl.. and your brother is so proud of you!! !